Your family holiday is important. It’s your chance to relax and enjoy quality time with your loved ones. Our collection of luxury family cottages in Herefordshire offers you the ideal spot to do this… read on to find out more. Family holidays are a special time. You know all too well that these years with the whole family together are precious and you want to enjoy every moment of your kids’ childhood. Our selection of family cottages offer you the perfect setting for family run, relaxation and for creating those special family memories that will stay with you forever. Set in the stunning Herefordshire countryside, Holt Farm is a collection of four family cottages, each with its own character and each suitable for different family group sizes. You can book one or a combination of our cottages to best suit your needs; the cottages are able to accommodate up to 22 people with ample dining space for everyone to dine together, ideal for much larger family groups. The cottages can also be booked individually and sleep 8, 7, 4 and 2 people each. The children will love the rural setting, with lots of outdoor space to play at the cottages and plenty of fun days out and things to do nearby. To find out more about our luxury family cottages, take a look at our Our Cottages page, or book now here. You can also contact us any time if you’d like to discuss any aspect of your family holiday or to book over the phone; simply use our online contact form or call us on 01981 510238. Holt Wain House is a character cottage at Holt Farm, accommodating four people and ideal for a family holiday. With level access through, Holt Wain House is particularly well suited to smaller children and to the less able. The cottage has a lovely feel to it, having been restored from a former horse-drawn cart house to a light and airy four-star accommodation for families. With plenty of outdoor areas, there’s lots of space for the children to play. There’s also an outdoor Hot Tub, barbecue and outdoor furniture for a lovely family meal ‘al fresco’ – perfect for the summer months. Find out more about Holt Wain House on our dedicate page, which includes a virtual tour of the accommodation, or book online now. If you’re travelling as a larger family group, Holt Farm can accommodate you. 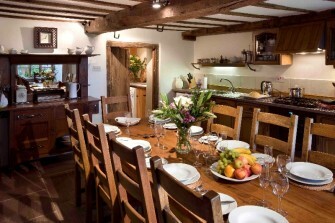 Holt Farm House is a rustic cottage at Holt Farm which sleeps up to 7 guests. With its own private patio and Hot tub, garden and enclosed lawns, it’s a lovely rustic cottage for a larger family group to enjoy and has dining space for up to 12 people. Find out more about Holt Farm House here. 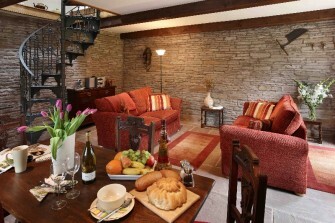 We also have Holt Barn, a gorgeous cottage with a eclectic mix of antique and modern design, which sleeps up to 8 people. 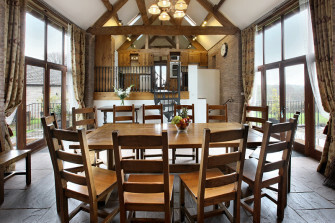 Holt Barn is our largest family cottage and is ideal for a larger family group. It also has space for up to 22 people dining. Find out more about Holt Barn here. We regularly welcome larger family groups who book one or more of the Holt Farm family cottages to accommodate more guests. By booking a combination of our cottages, you can accommodate up to 22 guests – which is why Holt Barn has dining space for 22 people and often becomes the social hub for large family holidays. You can book one or more cottages online here, or if you’d prefer to speak to someone, simply use our online contact form or call us on 01981 510238. There are lots of child-friendly activities throughout Herefordshire, from soft play areas to the Herefordshire trail. Take a look at the Days Out with the Kids Hereford, Brecon or Abergavenny for more ideas too. Families who have stayed with us before have enjoyed exploring Longtown Castle, visiting the Small Breed and Owl Farm and the local swimming pools – and much more! We’re locals here and have lots of local knowledge – give us a call on 01981 510238 if you’d like to chat more about things to do with your family in the local area. Of course, when holidaying in the UK, you an never be sure of great weather, but we’ve catered for that too! There are plenty of indoor activities available as you’ll see from the links above, and the Holt Farm cottages also offer lots of indoor space for family time. We’ll provide toys, board games and other fun activities to enjoy together, plus the cottages all come with wifi in all areas, iPod docks to play all your favourite music and plenty of lounge spaces with flat-screen televisions and DVDs for all ages provided for you. There are excellent catering options available to you. With plenty of kitchen space, the Holt Farm cottages are great for those who prefer a self-catering family holiday and there are lots of lovely shops in the nearby town to meet every taste. The area is well known for its delicious culinary delights, so do try the local stores for some lovely treats. If you’d prefer to eat out, the local restaurants offer a range of cuisines; we’ve shared some of our favourites here. The cottages have outdoor patio areas with barbecues for you to enjoy. You can also order your groceries online and have them unpacked ready for you on arrival; contact us to arrange. Our luxury family cottages include lovely spacious rooms, so no need for fighting over who gets the best one! 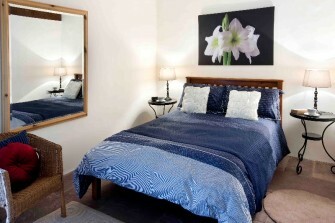 We offer a combination of double and twin rooms. We can also accommodate smaller children and babies with cots; contact us to arrange. You can book your family cottage online here or, if you’d prefer to book over the phone, simply use our online contact form or call us on 01981 510238.